Providing a variety of quality outdoor recreational experiences. Our department is committed to providing a cleaner, safer environment that goes hand-in-hand with economic prosperity and increased quality of life in Tennessee. We deliver on our mission through managing regulatory programs that maintain standards for air, water and soil quality while providing assistance to businesses and communities in areas ranging from recreation to waste management. We also manage the state park system and programs to inventory, interpret and protect Tennessee’s rich natural, historical and archaeological heritage. 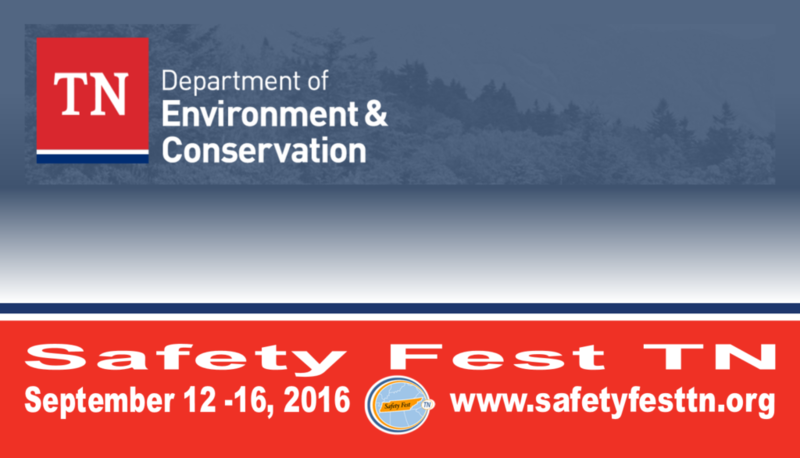 Safety Fest TN will be held September 12 – 16 at multiple locations in Oak Ridge and Knoxville, TN. Class schedule and registration have launched. Over 80 classes, sessions and demonstrations are planned for this year. All training is free and open to everyone who registers! Safety Fest TN, which started in 2012, provides free training to promote safety and health at work, at home and in the community. And what a community it is! Last year’s event had over 850 people registered from 79 cities in 6 states, representing 172 organizations. It included 66 free safety classes, seminars and demonstrations. The 51 Instructors were graciously provided by organizations giving back to the community. This year’s event is going to be bigger and better. Your organization can partner, sponsor or provide resources to promote safety and health too! For more information visit: https://safetyfesttn.org.